Handling process byproducts has always been a concern for ethylene producers. When it comes to wastewater treatment, spent caustic has always been the most challenging waste. In water-stressed locations, treating toxic components is not the only factor in achieving wastewater treatment and water recycling goals affordably. 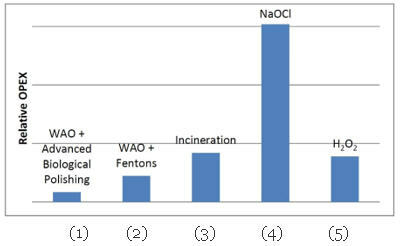 Part One of this article addresses the cost-saving implications of combining Zimpro® wet air oxidation (WAO) (Figure 1) with a biological and powdered-activated-carbon treatment (PACT) plus membrane bioreactor (MBR) technology in a compact, comprehensive system to support water-recycling goals. Water Recycling Efficiency In Ethylene Spent Caustic Treatment, Part II: Process provides a more in-depth look at the technology of the process and addresses the compliance implications of using it in water-starved regions such as the Middle East. Figure 1. 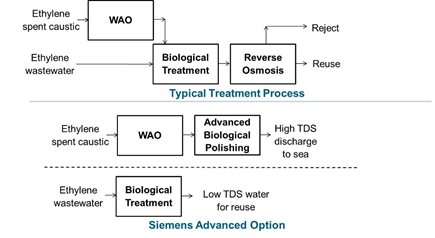 Wet air oxidation breaks down the sulfide-laden caustic stream into inert salts and biodegradable short-chain compounds, enabling WAO + Advanced Biological Polishing effluent to be discharged directly into a seawater environment. The biggest challenge to recovering water from ethylene production waste water treatment is the fact that it contains a lot of salt. This is typically the result of the need to polish the high TDS, oxidized spent caustic from wet air oxidation or incineration. Using a divide-and-conquer approach to treat the salt-laden oxidized spent caustic stream separately can be economically attractive, rather than diluting it in a larger integrated wastewater stream where it can complicate both biological treatment processes and reuse efforts. Segregated treatment is particularly desirable because oxidized spent caustic typically represents less than a few percent of the total flow to the biological wastewater treatment plant (WWTP) yet would represent most of the total salt to the WWTP. Among the alternatives for segregated ethylene spent caustic treatment — including offsite disposal, incineration, and advanced oxidation — Zimpro® WAO + Advanced Biological Polishing offer attractive cost and compliance alternatives. They help users maximize onsite water recycling and minimize concerns about effluent compliance. Simplified Water Reuse. Ethylene spent caustic typically represents a small volume of the multiple wastewater streams being treated in a petrochemical facility. However, it is a relatively high chemical oxygen demand (COD) stream contributing a substantial amount of biochemical/biological oxygen demand (BOD) load to the wastewater treatment plant. Incorporating it into a combined wastewater stream complicates recycling efforts and costs. Treating it separately eliminates the need to remove those salts from the large volume of low TDS water with reverse osmosis and dispose of a reject brine in order to recycle water (Figure 2). Figure 2. Using WAO + Advanced Biological Polishing allows for complete treatment of ethylene spent caustic, allowing for water reuse of the remainder of the petrochemical facility’s wastewater without reverse osmosis. Regulatory Compliance. The combined WAO + Advanced Biological Polishing process yields a clean effluent, pure enough to meet even strict Saudi Arabian Royal Commission discharge requirements for disposal to seawater. It also yields complete suspended solids removal, thanks to membrane filtration. The combined process uses WAO to destroy sulfides completely in ethylene spent caustic while converting the remaining organics to lower molecular weight compounds that are easily biodegradable before the high TDS stream is polished using a combination of activated carbon and biological treatment followed by membrane clarification. Sulfide, Mercaptan, And Organic Destruction. WAO removes the reduced sulfur species (sulfides and mercaptans) and converts large organics into small biodegradable components. No Noxious Odors. Malodorous compounds are broken down by the WAO process. Further, volatile organics in the WAO off-gas, which is largely spent air with little or no offensive smell, is completely treated in the PACT system, allowing for off-gas discharge to the atmosphere. High Reliability. A WAO + Advanced Biological Polishing solution may operate for years without shutdowns when rotating equipment is properly maintained. Packaging three proven technologies into one compact integrated process yields a complete solution that saves space over other approaches and costs less to operate over the long term. It also avoids the downside costs of using evaporation ponds that require a considerable footprint and eventually need to be cleaned out, with the salts being sent to a landfill for disposal. Low Maintenance. The primary maintenance focus of WAO + Advanced Biological Polishing is the routine maintenance of rotating equipment — the pumps, compressors, and blowers used to supply the effluent stream and air for the process. Spare units of rotating equipment provide built-in redundancy for quick switchover, so there is relatively little downtime. This compares favorably to incinerators, which demand labor-intensive downtime for periodic refractory replacement necessitated by the high pH and TDS in the spent caustic. Low OPEX. Compared to other segregated-treatment alternatives, the WAO + Advanced Biological Polishing process runs at a fraction of the annual operating costs. It averts potential environmental liabilities associated with expensive offsite shipping and handling. It eliminates the need for costly and time-consuming incinerator refractory replacement. 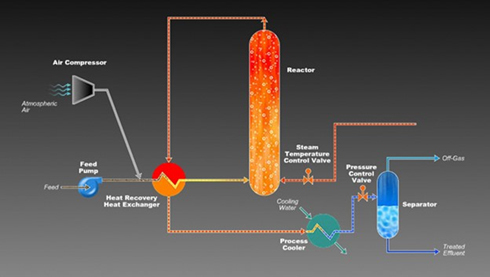 It operates at lower temperatures than incineration, resulting in a fraction of the energy costs. It avoids the need for expensive reverse osmosis, along with its necessary pretreatment steps to remove salt from a large combined waste stream. It also avoids consumption of large volumes of oxidizers, such as bleach, ozone, or peroxide, that can quickly become cost-prohibitive. Evading such process-specific drawbacks provides lower operating and maintenance costs for the life of the system (Figure 3). Based on both reduced operating cost and high effluent quality, WAO + Advanced Biological Polishing offer promise in a variety of ethylene production environments around the world where water scarcity and regulatory drivers for water reuse are mounting— including the Middle East, China, India, and Latin America. In the Middle East, for example, the volume of reclaimed water made practical by this recycling-friendly approach reduces the need to desalinate additional seawater to replenish freshwater aquifers. 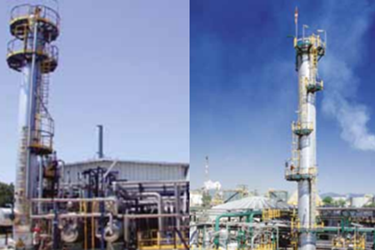 Equally important, the high-reliability, low-downtime nature of the process addresses key concerns about the unique demands in a petrochemical facility. Learn more about specific process performance aspects of WAO + Advanced Biological Polishing in Water Recycling Efficiency In Ethylene Spent Caustic Treatment, Part II: Process.